What color? What Shape? What is a Carat? What exactly is Clarity? Can I afford the two carat round brilliant flawless diamond you had planned on. Maybe, maybe not. Let me break it down for you in somewhat simple (or at least understandable) terms. There are four things to look for in any diamond. Color, Clarity, Cut and Carat. Let's start with color. Diamonds come in a huge array of colors. For our purposes right now I am referring to colorless diamonds. I know, how can you judge a diamonds color if it is "colorless". Well, diamonds are formed by nature, so all kinds of elements get in there while it is being formed and this effects the color of the diamond. For instance, the introduction of nitrogen in the formation process will leave the diamond with a yellow color. Obviously the more there is of this substance the deeper the color. I know I am off track. Just love yellow diamonds. For a very long time there was no standard of judging the color of a diamond. Then in the 1950's the Gemological Institute of America (GIA) came up with a standard for the industry to go by. A truly colorless diamond is given a D whereas a diamond with a slightly more yellowish color will be given a Z. Obviously anything in between these colors will be given a letter which falls in between. How does this effect your price? Well, in 2008 Rappaport did a study and found that a round diamond with D color classification (colorless) could cost up to 32% more than one with an E classification. Now the significant cost variation will not be as steep once you go from an I to an H for example. It is just that the D color is flawless and extremely rare. 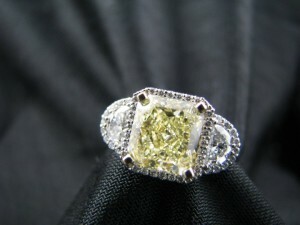 Now that being said, naturally colored diamonds can be just as rare as a flawless and therefore command a higher price. This brings me to the next quality that will effect your cost; Clarity. This means how clean is the diamond. An inclusion is an internal flaw of the diamond. As I mentioned above, when diamonds are forming different elements in its surroundings effect the outcome of that diamond. Some of the "flaws" can be significant enough to be seen with the naked eye. Others may still be there but they can only be seen with the assistance of a magnifier. Once again GIA has stepped up and given us a set of guidelines to follow giving a little more consistency to the industry and therefore passing that along to the buyer. There are eleven clarity grades by which the industry generally speaking follows. Flawless, Internally Flawless, Very Slightly included (VVS), Slightly Included (SI) and Included (I). There are additional levels between each category. For instance and SI-1 or SI-2. The difference being an SI-1 will possibly have the same amount of inclusions as an SI-2 it is just that the inclusions in the SI-2 are visible with the naked eye perhaps only in a little more obvious place. As with color, the inclusion could be significant and therefore calls for a lower price. On the other hand, it can be less obvious calling for a much higher price. This brings me to the next topic which is cut. 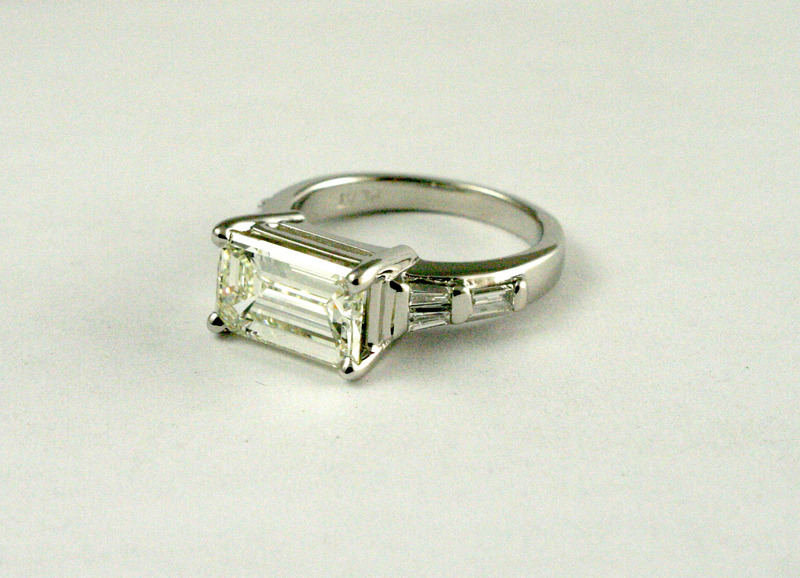 An emerald cut diamond will have fewer inclusions and hopefully a better color as it has fewer facets and thus closer to a "glass" look. There are so many different cuts of diamonds. For instance there is princess cut which is square in shape which falls into the fancy cut category. The skill of the diamond cutter is very important in any cut you choose. The cutter will create the facets to show the sparkle and colors the best. Furthermore, the cutter should look at the natural flaws of the diamond and attempt to cut the diamond to accentuate the naturally great qualities of that stone. Finally, the carat weight of the diamond. This essentially is the size of the diamond. Carat weight is measured in grams. Therefore a one carat diamond is equal to 2 tenths of a gram. The carat weight is measured in points. A 1 carat diamond is 100 points. The difference in cost from a .75 carat diamond (3/4 carat) to a 1 carat is significant. This is due to the demand. It is important to note there is a difference between carat and karat. Karat is a measurement for gold. Carat with a c is for gemstones. All four "C"'s are essential in figuring out how much you will pay for the diamond of your dreams. GIA has made things much more congruous across the industry. That being said, it is important to do your homework. Every diamond is different. You will never be truly comparing apples to apples. However, with an educated jeweler you can get the diamond of your dreams and learn a little something along the way.